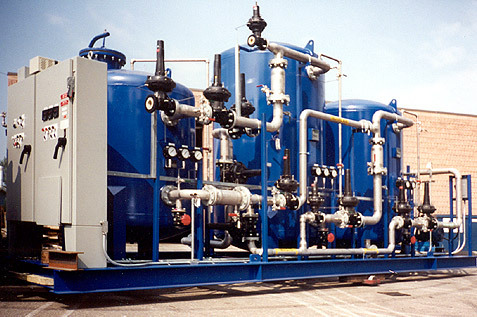 Since the Industrial Revolution, there has been a need for purified water for such industrial applications as boiler feed water and spraying and rinsing applications. Without purified water for boiler feed, scale builds up on heat transfer surfaces and boiler metals become brittle. In spraying and rinsing applications, minerals in water also scale spray equipment and cause imperfections on product surfaces. Early on, stills were used to produce purify water. Zeolites and later, sulfonated coal and greensand were used to soften water. The commercial use of ion exchange resins for boiler feed did not become feasible until the late 1940’s when strong base resins for the removal of silica became available. Ion exchange is a reversible chemical process based upon selectivity of the exchanger for certain ions. Water containing a variety of ions percolate through a bed of ion exchange resin and the undesirable ions are removed. When the resin is exhausted, regeneration is done to remove the undesirable ions from the resin. Over the years, improvements and engineering modifications were made to meet the requirements of the customers. A number of different methods have been employed to improve the product water quality, capacity utilization, and regeneration. Mixed beds were introduced in the 1950’s, condensate polishers, powdered resins and countercurrent technology in the in the 1960’s. Since then, there have been a number of engineering advances to refine these processes. The LiquiPack™ demineralizer offers extra advantages by utilizing upflow service with downflow regeneration. With this process, the concern over keeping the resin bed in place while allowing for adequate regeneration is minimized. It allows for lower rinsing rates than other processes by utilizing a rinse recycle step. While prefiltration is important to an ion exchange process, it is less critical on upflow service. The LiquiPack™ process allows for periodic external backwashing to relieve bed compaction or to remove resin fines.